November 12th 2017 - ATLANTIS, Fla. – This weekend, the South Florida PGA Junior Championship Tour presented by The Honda Classic held the Don Law Golf Academy Junior Championship on the Players Course at Weston Hills Country Club. 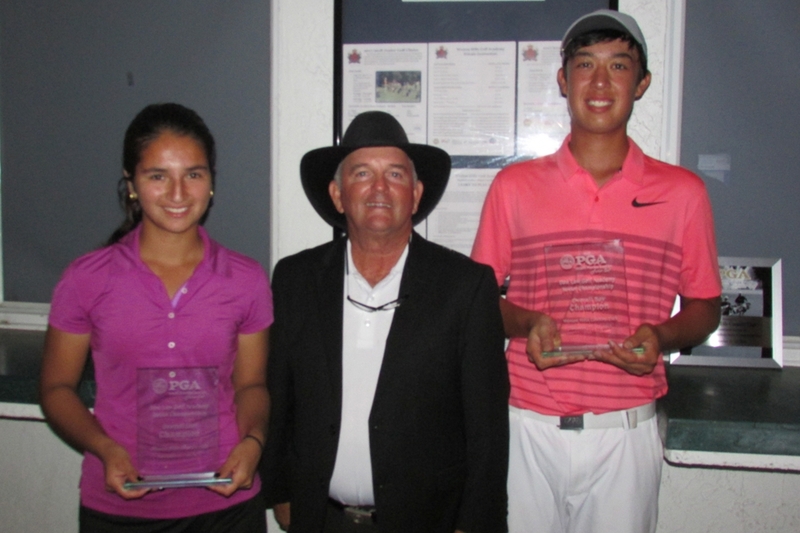 The field featured many of South Florida’s top junior golfers. Boynton Beach native Nicklas Staub has become one of South Florida’s top junior golfers over the past two years. The 14 year old has found himself atop the leader board frequently, and this weekend was no different. Staub opened up round one with a 2-under-par 70 to find himself tied for the lead with Port St. Lucie native Daisuke Nakano. Staub battled tough conditions on Sunday as winds reached 25 mph and rain passing through the course on and off throughout the round. Despite the tough elements, Staub still managed to put together a final round 1-under-par 71 to capture the Overall Boy’s Title. Palm Beach native Allan Kournikova would take home the boy’s 13-15 age division title, while Nakano would take home the boy’s 16-18 age division title. Laura Edmonds moved to Weston, FL 2 months ago. During that time she managed to win her first Challenge Tour event last month, and this weekend she managed to capture her first Championship Tour event to prove she can hang with the section’s top junior golfers. Edmonds, fired an opening round even-par 72 to put herself two strokes clear of Doral native Skylee Shin. Edmonds put together another even-par 72 on Sunday to capture the Overall Girl’s Title by 7 strokes. Shin would go on to capture the girl’s 13-15 age division, while Wellington native Isabel Herrera would take home the girl’s 16-18 age division. The SFPGA Junior Tour presented by The Honda Classic is a membership-based tour open to boys and girls ages 11-18 in South Florida with the aspirations and skill levels to compete at the High School and Collegiate level and features some of South Florida's most talented junior golfers. The Junior Tour offers twenty-five two day championship events for junior golfers in South Florida. The 28 events are divided between the Championship Tour, an invitational tour featuring extended yardages, and the Challenge Tour. The South Florida PGA Junior Tour is proudly presented by The Honda Classic and supported by Antigua, Club Chef, Don Law Golf Academy, Junior.Golf, Lipman Produce, Natalie’s Orchid Island Juice Company, Palm Beach County Sports Commission, Power Crunch, Pukka, The Men’s Fun Group at Mirasol, Skimp, Titleist, and TLINK Golf.